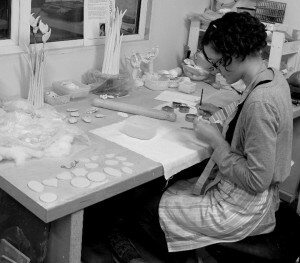 I am a ceramic artist based at Workhouse Studios in Ireland. I graduated with a First Class Honours Degree in Ceramic Design from the Limerick School of Art and Design in 2010. My work has won a number of awards including IACI Muriel Gahan Development Award, the AIB Award for Excellence in Ceramic Design and a Future Makers Award 2011. Working with porcelain clay, I hand build sculptural forms which are fired to 1260 C. My work combines both my interests in ceramics and biology in a curious, investigative way. It is commenting on our insatiable appetite to explore and categorize this constantly changing world. We are not merely content to know that something exists; we need to classify it to make order out of persistent randomness. With my current work I am inspired by the patterns and textures that are formed by bacteria and fungi.